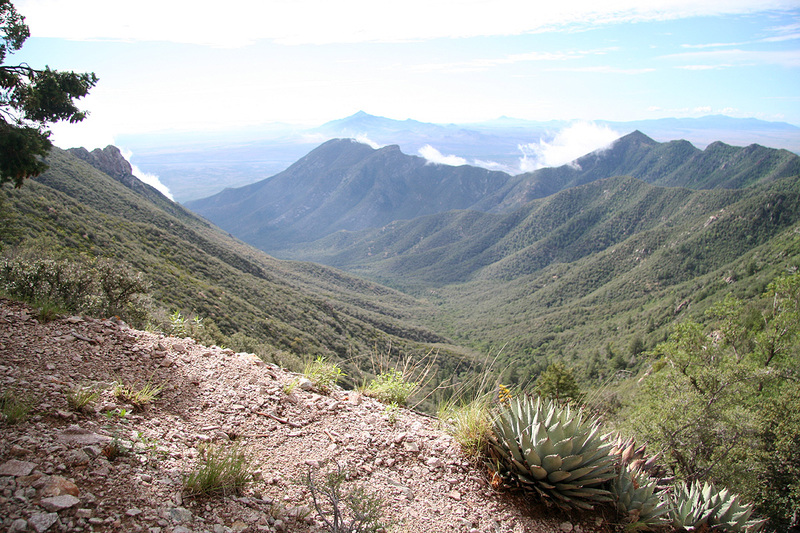 How to get there: The city of Tucson, Arizona is a good point of departure. Get on the interstate I-10, direction east and drive approximately 45 miles to exit 302, where you get off on 90 south. Measure from here. Drive 27.3 miles (from I-10), then make a left at a traffic light in order to stay on Hwy. 90. At mile 31.7, continue straight at the traffic light. You now enter Hwy. 92, since Hwy. 90 made another sharp left turn here. Continue along hwy. 92 until mile 43.7. Here, East Ash Canyon (or only Ash Canyon) goes right. This is a dirt road, but ordinary cars may drive most of the way with some caution. At mile 45.3, the road forks. 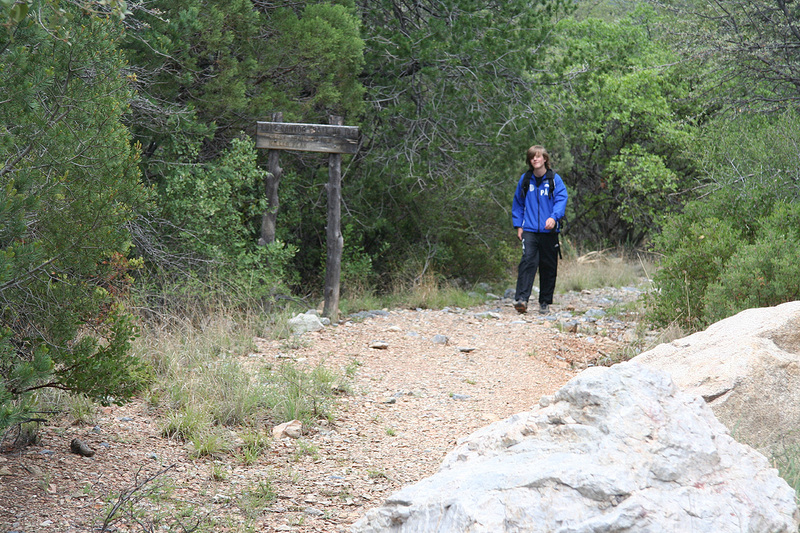 Stay right, there is a sign saying Lutz Canyon at this junction. The road gets rougher as you stay right and contine a last 0.5 mile to the trailhead at mile 45.8. There is ample space for parking, park here, this is the trailhead, location N31:22.734, W110:15.790, elevation 1786 meter. 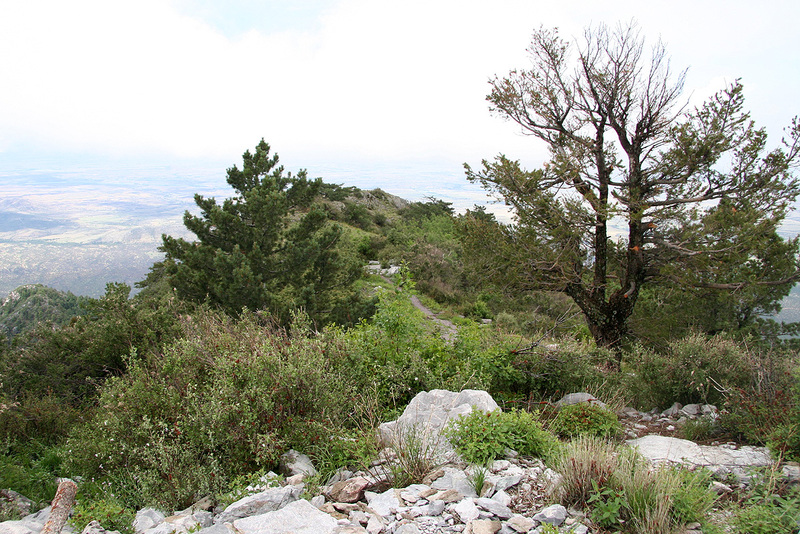 Route description: Start hiking up along the remains of an old road, it is a bit eroded and few hikers seem to use this trail. Higher up, you may see some old machinery (used for mining?) off on your right, the trail starts to zig-zag, then changes from wide to a rather distinct (but smaller) trail going right. This trail continues to gain elevation until you reach the tunnel, an old shaft where litter is everywhere. One should try to clean up this place. You are now at location N31:23.228, W110:17.417, elevation 2455 meter. The view back down the canyon is quite good. From here, the trail climbs more slowly as it also contours more left in order to reach a small col in the main crest above. Here, you meet the main crest trail, there are several old wooden signs. Make a left and follow this bigger trail as it continues to climb along the main ridge. Higher up, you will find a new trail fork, the main crest trail continues straight, while signs clearly tells that Miller Peak is the trail that forks right. Take this trail as it climbs gently to the summit of Miller Peak. 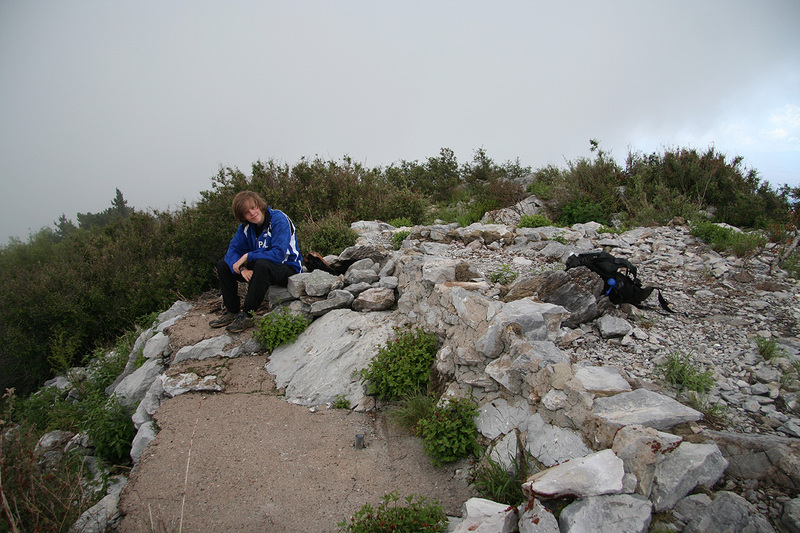 Comments: I did this hike with my son Pål Jørgen. We drove from Tucson, and were ready to hike at 0725. It took us one hour to the tunnel, then another hour to the summit. 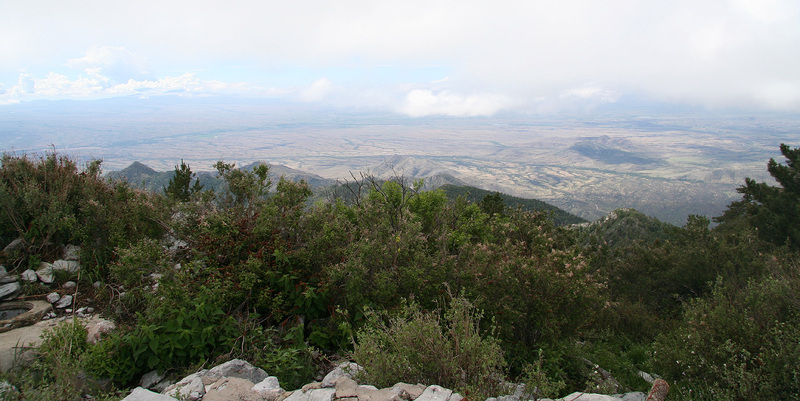 It was cloudy, but some breaks provided a good view into Mexico (south) as well as across the local mountains. We started down at 0945, reaching the car in 1.5 hours at 1115. A nice morning hike, within the next hour we had strong rain hitting our car and thunder developed as we came back to Tucson around 1300. 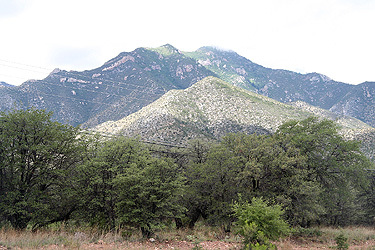 Miller Peak, as seen from below. Lutz Canyon, as seen from where the tunnel is. The summit. Pål Jørgen enjoys the views. Pål Jørgen returning to the trailhead.